Recently, FramesDirect.com added the Paul Smith Collection by Oliver Peoples to the long list of amazing designer brands we offer. Sir Paul Smith is an English designer who is known for creating timeless, English designs. Oliver Peoples is known for its superior craftsmanship, high quality materials,and amazing designers. 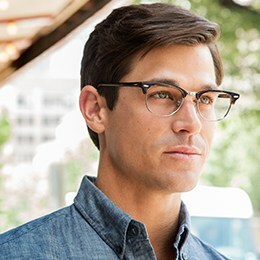 Paul Smith Eyeglasses are modern, sophisticated, and are available in many different colors to fit your personal style. Paul Smith Sunglasses feature classic shapes such as Clubmasters and Key-Hole Bridges. These festival friendly frames create a fun and retro look that flatters most face types and would match any style.